Your data in your hands. 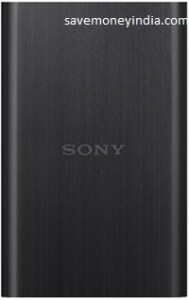 Features Terabytes More Storage, Plug and Play, Fast File Transfers, Storage to Go, Ready to Use & USB 3.0 and 2.0 Compatible. 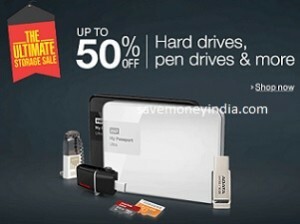 Hard Disks, Pen Drives & more upto 80% off. 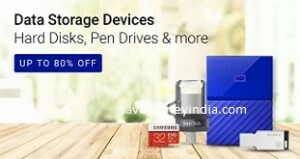 Amazon is offering upto 50% off on Pen Drives, Memory Cards & Hard Drives. 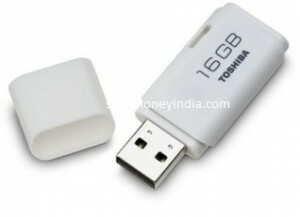 Features MICRO-B & standard USB. Features stylish, compact design and generous capacity, the Cruzer Blade USB Flash Drive makes it easy to back up, transfer, and share your files. 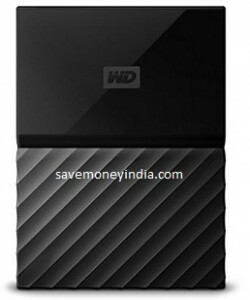 Features Manufactured by Seagate, Scratch and fingerprint-Resistant finish & Seagate AutoBackup Software included free. 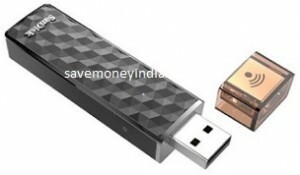 Features Drag and drop file saving, right out of the box, USB powered & Fast data transfer with USB 3.0 connectivity. 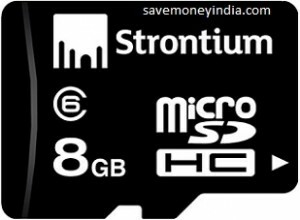 Features If you need a thunder-speed data transfer, the more you should try out Strontium MicroSD Card Class 6 that would show you the real power of speed. With an improvement of transfer speed to 6Mb/s, you will be amazed that the data transfer is complete with a blink of your eyes. It can store higher definition of videos, higher resolution of photos and you dont have to worry about losing your precious data. Features Fashionable Design & Pocket-sized and Lightweight. 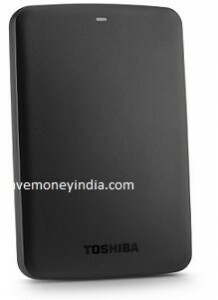 Amazon is offering upto 50% off on Solid State Drives. Features Fast Transfer Speeds, Easy Plug-And-Play Operation & Compact Casing. • The offer is applicable on purchases made using only Amazon Pay balance during the offer period on select products listed under this offer. 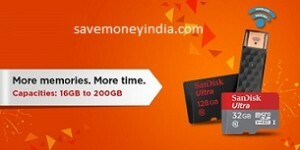 • The offer is only applicable on purchase of pen drives and memory cards. 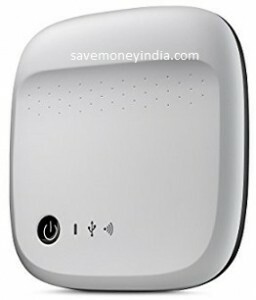 • The offer is applicable on the purchase of only select products, for 15% Cashback upto maximum of Rs. 150 per customer. • The customer will receive the Cashback in the form of Amazon Pay balance, which would be added to the Amazon account within 3 working days of the product shipping date. • Offer Duration: 4th – 5th September 2017. 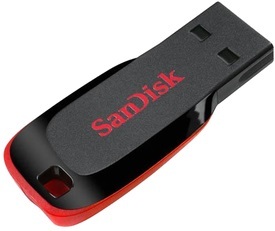 • Purchase any of the SanDisk Products and get an assured gift card worth Rs. 100 as Amazon pay balance. 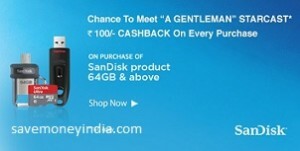 • Purchase any of the WD Products and get an assured gift card worth Rs. 200 as Amazon pay balance. • The gift card amount will be credited to the customer’s account on or before 5th September 2017. • This promotion is valid from 5th August 2017 to 15th August 2017. Features preloaded with softwares that enhance faster transfer speeds, provide greater data security and automatic backup for all your important files. Features 30W RMS, Transformer based circuit for distortion free music, 4inch Woofer speaker & 3inch satellite speakers, Dedicated Volume, Bass & Treble knobs, Multiple mode to enjoy music – FM, USB and Aux-In & Bluetooth connectivity to ensure Wirefree Music. 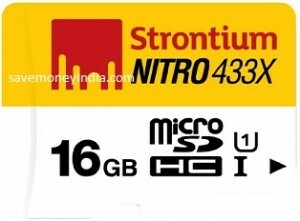 Amazon is offering upto 44% off on Strontium Nitro MicroSD Card Class 10. Features With the SanDisk Connect app installed on your mobile device you can upload, download, save, share and play all your stuff from a distance, to and from the device you want to use. 25% Cashback upto Rs. 150: Payment Method > PhonePe. Cashback will be credited into Your PhonePe wallet within 24 hours of successful placement of the order. 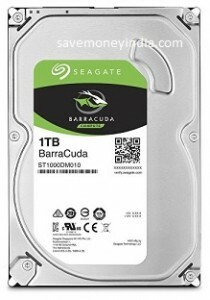 Features Cost-effective storage upgrade for desktop computers, Store all your games, music, movies and more with up to 1TB of storage, SATA 6Gb/s interface optimizes burst performance, 64MB Cache, Seagate Secure models for hardware-based data security & Instant Secure Erase allows safe and easy drive retirement. Features Auto backup with included WD backup software, Password protection with hardware encryption, Easy and ready to use out of the box & Bold, vibrant design in wide range of beautiful colors. Features Stream to 3 Devices at Once, Back Up Your Mobile Devices, on the Go & Works with Your Favorite Devices. 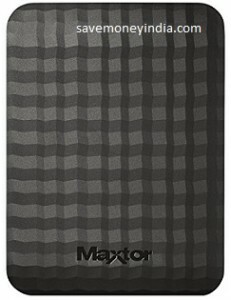 Features easy-to-use solution when you need to add data storage to your computer instantly.